The first reviews of the new iPad are in and have been published online. In order to give you an early idea of user experience of the device — which notably includes a retina display — and help assess whether it is worth your money, we’ve combed the Web to serve up a complete picture of what’s been said about the new iPad so far. To summarise in brief, all of the reviewers are very impressed by the retina display, while the new and improved cameras and surprisingly long-lasting battery life is noted too. LTE is noted as an important addition as it allows far greater performance on the go, but the 4G mobile broadband technology is only available in some countries, such as the US, right now. Most reviewers believe that the new iPad will take Apple even further ahead of the competition in the tablet space but there is a question mark over whether the changes are enough to tempt existing iPad 2 owners to buy the new device. Here then, are the views, opinions and takeaways of 12 reviewers who’ve trialed and tested the new iPad in advance of it going on sale on Friday. The Retina display will make you do a double-take the first time you see it….The only thing I can think of that comes close is comparing it to the first time you ever saw an HDTV. Remember how startling it was to go from one of those giant standard definition projector TVs to an HDTV? That’s what this is like. The iPad’s display, however, makes all other device displays look pedestrian by comparison. And if you’re an original iPad or iPad 2 owner… unless you want to upgrade, just avoid looking at this screen. Yes, this display is outrageous. It’s stunning. It’s incredible. I’m not being hyperbolic or exaggerative when I say it is easily the most beautiful computer display I have ever looked at. Perhaps it has something to do with the fact that you hold this in your hands, or maybe it’s the technology that Apple is utilizing, or maybe it’s the responsiveness of iOS — but there’s something almost bizarre about how good this screen is. After the launch event, I described the screen as “surreal,” and I still think that’s a pretty good fit. It’s hard to overstate the significance of the new screen. Apple has packed four times as many pixels into the same space and the improvement has to be seen to be believed. The display is extraordinarily sharp. Text and photos look beautiful. Put the new iPad side-by-side with the iPad 2 and the differences are amazing. The iPad 2 suddenly looks so blurry. How have I never noticed that before? 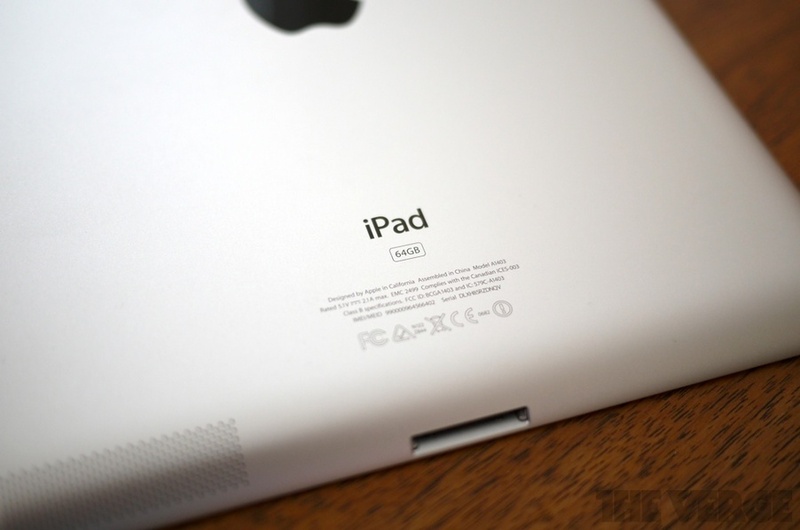 It’s possible to see details on the new iPad that were just indistinct smears on the iPad 2. App icons are sharper and you can even read some of the tiny magazine covers on the Newsstand icon. Steve Jobs would have approved of the new iPad. With its focus on the holistic experience rather than individual boasts around its constituent parts, it’s the epitome of the Post-PC world the Apple founder envisaged. No lag or delay; no frustrating cloud settings or arcane minimum software requirements. Simply pick up, swipe, and you’re immersed in a joined-up ecosystem. Apple doesn’t need another revolution, it has already started one, and the new iPad brings a fresh degree of refinement to a segment in which it is undoubtedly the king. It has the most spectacular display I have ever seen in a mobile device. The company squeezed four times the pixels into the same physical space as on the iPad 2 and claims the new iPad’s screen has a million more pixels than an HDTV. All I know is that text is much sharper, and photos look richer. If you already own an iPad 2, and like it, you shouldn’t feel like you have to rush out to buy the new one. However, for those who use their iPads as their main e-readers, and those who use it frequently while away from Wi-Fi coverage, this new model could make a big difference. Since it launched in 2010, the iPad has been the best tablet on the planet. With the new, third-generation model, it still holds that crown. In his iPad review at Daring Fireball, John Gruber explains that with its increased RAM and camera improvements, the new device is what he had asked for when he first got his hands on the iPad 2. Reading on the big retina display is pure joy. Going back to the iPad 2 after reading for a few hours on the iPad 3 is jarring. With bigger pixels, anti-aliased text looks blurry; with smaller pixels, anti-aliased text looks good; but with really small pixels like these, anti-aliased text looks impossibly good — and what you thought looked pretty good before (like text rendered on older iPads) now looks blurry. The retina display is amazing, everything in the UI feels faster, and the price points remain the same. What’s not to love? It’s that simple. My experience with AT&T’s LTE network in San Francisco was impressive. While riding through the city, I was able to get speeds that were roughly as fast as my office Wi-Fi. When I turned off LTE (there’s an “Enable LTE” option in the Cellular Data section of Settings), the iPad fell back to AT&T’s “4G” HSPA+ network, and speeds dropped precipitously. Users of the iPad 2 shouldn’t fret: Their iPad investment is certainly good for another year. But they might not want to look too closely at the new iPad’s screen. Once you get a load of that Retina display, it’s hard to go back to anything else. Because the new iPad looks largely the same at the iPad 2 from an industrial design perspective, many were lulled into believing that Apple was getting complacent. Let me be clear: the new iPad is a huge technological leap forward. It has by far the best screen I’ve ever seen anywhere and it’s something I can hold in my hand and touch and use for 10 hours at a time. If you have the original iPad, I say this is a no-brainer. If you have an iPad 2, it’s a tougher call since it still seems nearly as fast as the new iPad. But if you choose not to upgrade (or to spend $399 for the 16 GB iPad 2 now), again, treat the new iPad as if it were Medusa when you’re in an Apple Store. Do. Not. Look. At. It. There still isn’t an SD slot, or a USB connection, or direct HDMI out. Nor is there the ability to play .AVI or Flash files, and the iPad won’t pick up files on a network (such as a network attached storage drive running the DLNA protocol, which gives you plug-and-play on desktop computers and lots of home devices). You can’t install alternative virtual keyboards (such as Swype, offered on devices such as the Motorola Xoom). You can’t browse the file system as you can on, say, an Android tablet. You can’t add extra storage via an SD slot. The iPad 3 puts Apple a mile ahead of anything we’ve seen from Android tablets. The interface is unchanged. But all sorts of incremental details – especially the screen, but also the camera capability and so the graphics heft, and the mobile broadband capability – have been ratcheted up. if you don’t think you’ll be able to tell the difference in the screen, and if you think LTE is not going to happen in time, good news: the iPad 2 is now cheaper than before. Win-win. If you have an iPad 2, it’s a little harder to justify springing for the latest model now, much as you might want to. Yes, the new screen is spectacular, and 4G and the improved cameras are welcome upgrades. But you would have purchased that iPad 2 much more recently and it may be difficult to plunk down extra cash this soon, unless you have a family member who can inherit your current model. But oh, what a screen. For this new edition, Apple has replaced the previous, perfectly nice one with the same so- called Retina Display it introduced on the iPhone 4. The new screen provides 2048 x 1536 resolution, which is to say four times the number of pixels of the old one, and more even than a high-definition TV set. On the outside the new iPad looks just like the iPad 2. The shape and size haven’t really changed. In fact, if you’re a Starbucks poser, you may be disappointed that the person at the next table won’t necessarily know to be envious that you are using the third generation of the iPad. On the inside, well, that’s a different story. The new iPad includes a better display, faster performance, better camera, and a snappy new operating system. Those may seem like small steps in the tablet space. But having used the new iPad for the past week now, I can tell you it’s a giant leap for connected mankind. With the device going on sale this Friday, you’ll soon have the chance to give it your own hands-on review, if you’re one of the first buyers that is. But in the meantime, we’re interested to hear your thoughts based on what you’ve heard and seen so far. Will you be buying the new iPad? If you already own an iPad, can you justify the purchase? Do Android and other tablets still appeal to you?